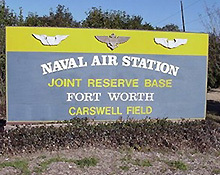 Naval Air Station Joint Reserve Base Fort Worth is a joint defense facility which plays a pivotal role in the training and equipping of air crews and aviation ground support personnel. The installation is located within the city limits of Fort Worth, Texas. NAS Fort Worth JRB employs over 11,000 active, reserve, and civilian personnel and generates a $1.3 billion annual impact to the local economy and the North Central Texas region.